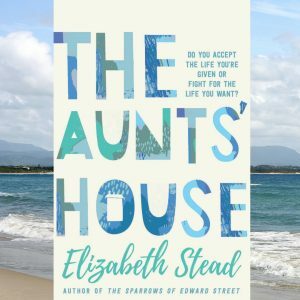 The Aunts’ House is a delightful coming of age story set in 1942 Sydney. Author Elizabeth Stead has conjured an ensemble of quirky, lovable characters that would make Charles Dickens envious. Angel Martin is an orphaned child foisted upon long-suffering boarding house mistress, Missus Potts. Enraged upon discovering Angel hasn’t brought the inheritance she’d counted on when she promised her dying mother she’d look after her, Missus Potts promptly sells Angel’s few worldly possessions and puts her new charge to work in the kitchen. But Angel refuses to accept her lot in life. Every Sunday she rides the tram to the beach where her father’s spinster sisters live. She is not welcomed by her only surviving relatives: they lock the gates on her, tell her to go away and blame Angel’s mother for killing their brother. Angel isn’t deterred. She’s determined to wear them down and make them love her. She regularly climbs the fence, breaks into the house and forces her way into their lives and their hearts. Angel is frequently accused of being not right in the head; ladies on the tram whisper ‘autism’. The beauty of this book is that Angel’s mental state is never given a definitive label. The story also makes it’s quite clear that madness is relative. Missus Potts’ boarding house lives in the shadow of the local sanatorium where Angel’s mother died and Winifred Varnham’s sister is being treated. And yet at times the boarding house and the aunts’ house both feel like mad houses. It begs the question – where does quirkiness end and mental illness begin? Who’s to say what is ‘normal’ anyway? Angel Martin had a favourite writer at that time. It was Mister Charles Dickens and he would have loved Persia Potts. In fact, she thought Charles Dickens would have loved the whole bloody thing – the boarding house and its madness and milk carts slipping down the surface of Duffy Street, never mind the season. He would have loved it all. Dickens had an amusing habit of sending troublesome characters to Australia at the end of his 19th century novels. I often wondered what happened to them and their descendants. Thanks to Stead’s wonderful new novel, now I feel like I know! This is a really fun, beautifully written story with characters that will stay with you for a long time. Oh this sounds like one worth putting on my list. Great review.